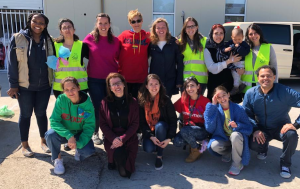 This week, together with our friends from the organisation EuroRelief, we had the wonderful opportunity of co-hosting a team of volunteers from Artolution who came to Lesvos, including their global ambassador Katie Holmes, her daughter Suri Cruise, fashion designer Emma Altman, and other dear new friends. While Max went on to paint a beautiful mural inside the Moria Camp, Katie and the team served mostly at our Centre for Refugee Women & Children, which is located right outside Moria Camp in Lesvos. They were there with us from Monday to Friday, teaching our refugee guests to design costumes and preparing them to present a short play in public on Friday afternoon. The dedication, simplicity and genuinely loving attitude of Katie and the whole team touched many lives. We loved watching our guests engaging with the activities they led. We loved seeing them being able to express themselves freely and being encouraged to continue to deal with their pain and trauma through arts, performing, singing and dancing! We would like to say a huge thanks to Katie and the whole Artolution team for sharing your time and talents with our refugee ladies and kids this past week and for the donations to our centre! May your example serve as an inspiration for many others to engage with the refugee cause in whatever capacity they are able to, and with whatever talents they may have.